In the context of smaller budgets and more sophisticated security exploits, many entities are turning to out-of-band authentication (OOBA) to strengthen their Identity & Access Management strategies. 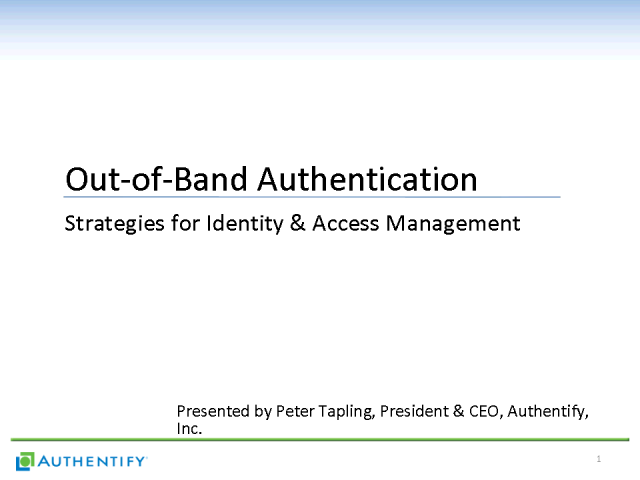 This presentation will take a practical look at the different types of out-of-band authentication, the benefits of incorporating OOBA, and best practices for implementing in an existing IAM environment. Peter Tapling, President & CEO, Authentify, Inc. Presented by: Peter Tapling, President & CEO, Authentify, Inc.